Indeed, a man needs his nuggs--and brands need to take a lesson from Wendy's smart interaction with a (non-influencer) teen. Don’t ignore the little guy. The average Twitter user, who doesn’t rank high on any PR firm’s list of influencers, can offer brands an opportunity for widespread positive media coverage—if only marketers would see him or her as worthwhile. That’s the takeaway from Wendy’s simple, one-off response to a once-little-known Twitter user who could improbably set a new social media benchmark, say social media experts. 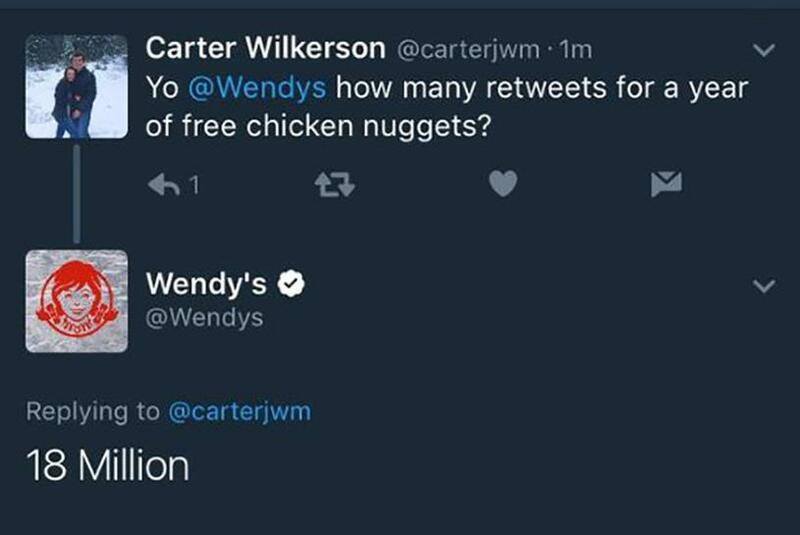 When Carter Wilkerson, a 16-year-old high-school student from Reno, Nevada, asked the fast-food chain how many retweets it would take to get free chicken nuggets for a year, Wendy’s replied in its usual cheeky and sassy brand voice: "18 million." The teen answered, "Consider it done." The exchange between the teen and Wendy’s is on-track to break the record for retweets set by talk-show host Ellen DeGeneres after she tweeted a selfie during the 2014 Academy Awards that garnered 3.3 million retweets. As of Friday morning, Carter’s tweet had been retweeted 2.8 million times. Even DeGeneres has playfully encouraged her fans to support Wilkerson in a mutually beneficial deal for both of their tweets. "If I can ride your coattails to 18 million retweets, I'll give you a year's supply of Ellen underwear and this 55-inch TCL Roku TV," she said on her show. Wilkerson has become something of a celebrity. The hashtag #NuggsForCarter has become a movement on Twitter, and the teen has been profiled by People, USA Today, and other outlets. Celebrities such as Breaking Bad star Aaron Paul and brands including Microsoft, GoDaddy, and Apple have also thrown their weight behind his cause. "Brands should take note," says Alexandra Kirsch, VP and director of editorial and social media strategy at Finn Partners. She notes Wilkerson turned into a social media star only because Wendy’s responded with a challenge for him. Many other brands would have let his tweet go unanswered, given at the time he only had a few thousand followers. (He now has more than 52,000). "We invest so heavily in influencers—and, of course, they have their place within a strategy—but not enough value is placed on the average follower, engager, or other such digital passerby," explains Kirsch. "Brands that have a strong handle on their social strategy will know when to engage, and when not to." The interaction has even resulted in a fundraising play for Wendy’s. Wilkerson created a website to raise money for the Dave Thomas Foundation for Adoption, which was created by the brand’s founder in 1992, and Pinocchio’s Moms on the Run, a group that supports women with breast cancer and their families in Reno. "When these sorts of efforts truly pan out the way it did for Wendy's, they offer a huge return on engagement," Kirsch adds. "Wilkerson is proof that influence and awareness go beyond audience numbers, and that a small-scale stunt or easy exchange of engagement can have sustainable and meaningful impact." Of course, brands can’t respond to every social media post, so they focus on interactions with influencers with reach. Everyday social media users, if they don’t get radio silence, may receive an automated message. "You’ve seen a lot of companies with their influencer marketing strategies focus on a handful of A-listers, either celebrities or super-bloggers," says Jeff Beringer, Golin’s global practice leader for digital. "But more brands are starting to diversify the voices they’re looking to interact with." He adds that Wendy’s clearly did its research and found this teen legitimately loves his nuggets—his Twitter bio reads "I like chicken nuggets—was a super fan, and fit its target market. "Someone may not have much reach, but if you shine the spotlight of the brand on them—as opposed to publishing something out yourself—like Wendy’s did, then you can have a tremendous impact," Beringer says. He adds that brands can accelerate the spread of a post by paid media, content syndication, and posting it on their owned channels. Asked for comment, the fast-food chain says it is working with Ketchum and digital partner VML "to monitor and amplify the Twitter conversation and respond to media interest" after it threw down the gauntlet to the Nevada teen. It is "making sure we’re handling every response appropriately and preparing for what might come next," the brand added. "Trying to make something like this happen doesn't work because the Internet can spot a phony from a mile away. When something organic comes around, you have to lean into it and lean into it hard. Embrace the trend that people put in front of you and ride the wave," the company said in a statement. "Wendy’s uses community management to engage with our fans (and haters) online—it gives the brand a human touch, so responding to [Wilkerson] was natural." Experts say the decision to "lean in" has generated millions of dollars in commercial value for Wendy’s. Eventually, it should be able to draw a correlation between the tweet and nugget sales month-on-month or year-on year, they say. It would have been difficult for Wendy’s to guess the scale to which the tweet would go viral, but it could have predicted Wilkerson would take the brand up on its challenge. The trick is to map a potential storyline from the very first tweet, should a conversation build from it, says Sabrina Lynch, VP of consumer marketing at Zeno Group. "If you put copy together to elicit a one-off response that has no context or facilitates a bigger conversation, then it’s just a waste of characters," Lynch adds. "It needs to be a purposeful exchange where the user forgets you’re a brand and has actual dialogue with a person." Jeppe Christensen, SVP of content and social media at Text 100, notes Wendy’s response was another example of how "we’ve shifted from a broadcast model to a stimulus-response model where brands and customers can have conversations with each other." "The customer’s expectation is being changed, and it will be increasingly difficult for brands to stick to just broadcasting content and not engaging in reactive exchanges with the people they pretend to care about," he says. "Best practice in content marketing is to address the needs of your audience. In this instance, Wilkerson was looking for a reaction from Wendy’s, and they gave it to him." This story first appeared in PR Week.